The new addition will reorient the museum’s entrance and will feature a grand entry lobby. Frederick Fischer & Partners (FFP) and the Los Angeles County Natural History Museum (NHM) have unveiled initial conceptual designs for an ambitious 485,000-square-foot expansion and modernization plan for the museum that aims to reorient the complex amid increased development in Exposition Park. The 104-year-old institution wrapped up a previous modernization plan in 2013 that produced a new wing designed by CO Architects as well as 3.5 acres of updated performative landscape designs by Mia Lehrer + Associates. 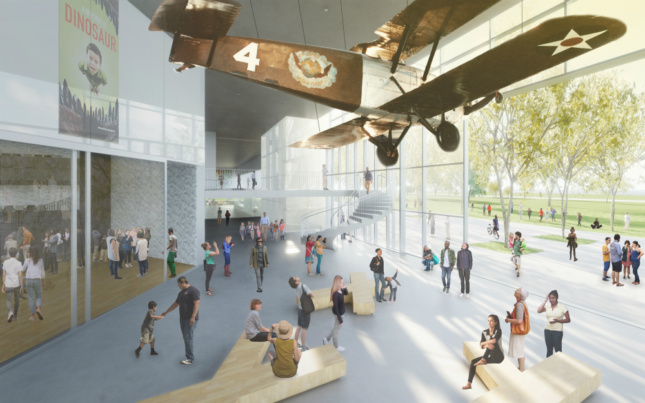 The FFP-designed addition will boost the museum’s overall square footage by an additional 60,000 square feet over current designs. Initial renderings for the FFP expansion depict a three-story, glass-clad structure rising along the western edge of the historic NHM building. The new addition will be designed with the intent of creating visual porosity between the institution and the surrounding park lands, an increasingly-important aim as the museum and the new expansion will soon be flanked by the forthcoming MAD Architects–designed Lucas Museum of Narrative Art. To better connect with Lucas Museum visitors, FFP’s addition will feature a ground floor atrium wrapped in double-height, operable walls that can open and close with the institution’s needs. The building’s uppermost level is depicted in early renderings with a rooftop terrace containing a restaurant that is open on two sides while other areas appear more generic in nature. The addition is wrapped in a grid of square-framed curtain wall sections that give way to the double-height entry lobby along the southern facade. 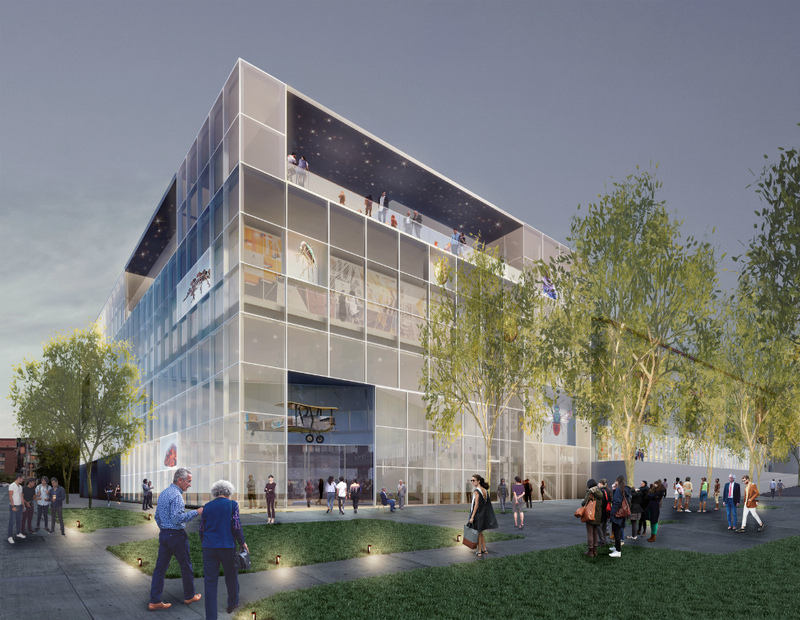 A key component of the expansion includes the addition of new theater facilities to “serve as a meeting space for dialogue about critical issues affecting our natural and cultural worlds, and as a vital gathering place for the community and neighborhoods around Exposition Park,” a press release announcing the expansion states. The new museum addition would be wrapped in glass to draw in visitors and to visually connect with the forthcoming MAD Architects-designed Lucas Museum of Narrative Art. 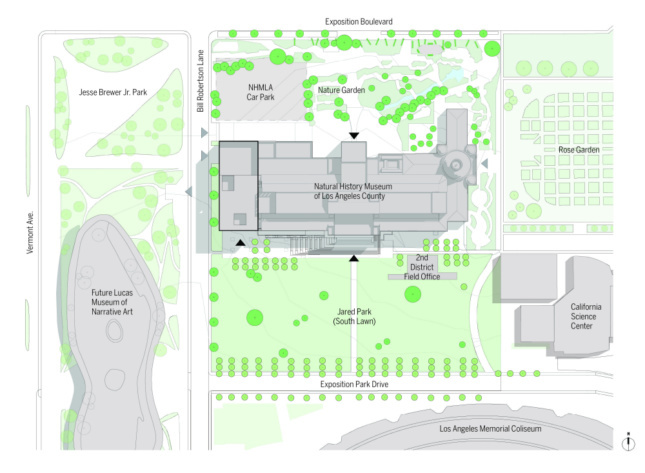 The NHM addition comes amid sweeping change for one of L.A.’s marquee urban parks. Aside from the addition of the Lucas Museum, the park will soon host the new Banc of California soccer stadium designed by Gensler for the Los Angeles Football Club. Development is booming in surrounding areas as well, fueling community displacement amid a regional housing and transportation crisis. Exposition Park is currently in the process soliciting proposals for a new master plan for the park as the Office of Exposition Park Management seeks to prepare the park for the addition of new facilities as well as for the central role it will play in the 2028 Olympic Games. FFP is also currently developing a long-term facilities plan for the museum that will guide further design efforts for the expansion.